These quick crispy roasted sweet potatoes are honestly one of our go-to recipes for breakfast, lunch or dinner! You can never have enough crispy sweet potatoes in the house, at least ours! What I love about this recipe is that it is super fast to whip up and oh so satisfying. Like I could lock myself in the closet and eat the whole pan by myself, oops! The key to making these crispy is to make them really small and cook them at a really high temperature in the oven. Just keep an eye on them because we want them crispy but not burned to smithereens! That would just be a crying shame! We love to eat these with eggs and bacon for breakfast, but they are also pretty tasty on top of a salad for lunch in place of croutons or as a side for dinner with some roasted chicken, yum! You really can do so many things with this recipe, there are infinite possibilities! To make this recipe even easier, cut the chunks ahead of time and store in the fridge so they are ready to go when you need them! Just store them in a covered container and you are good to go at the drop of a hat. You could cook them up ahead of time and refrigerate, but they won’t be as crispy the next day. You would have to pop them back in the oven and try to crisp up once again. If you’re a sweet potato lover and hoarder, like me, you will want to make this recipe over and over and over again. I hope you love these crispy taters as much as we do! Happy roasting! Line baking sheets and set aside. Wash, scrub and dry your potatoes. Cut potatoes in half lengthwise and then cut those halves into 5-6 strips. Add small chunks into a bowl and toss with oil, salt, pepper and herbs. 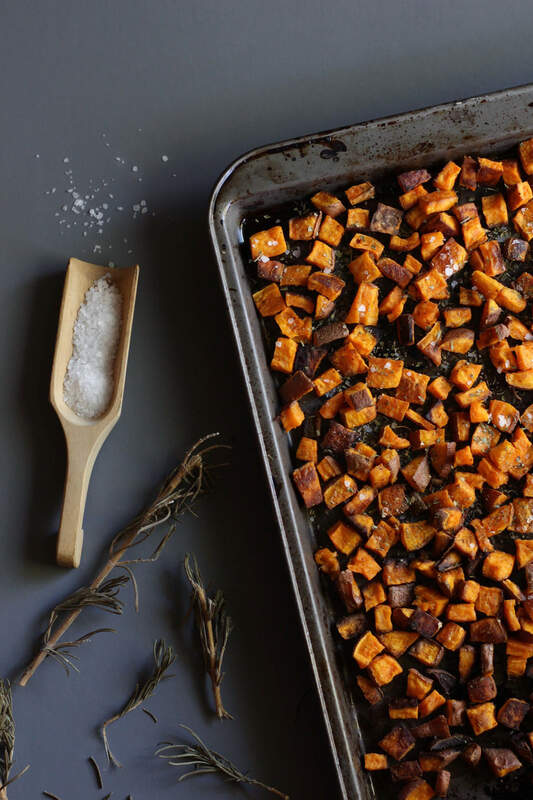 Add coated sweet potatoes to your lined baking sheets and roast side by side in a 450 degree oven for Aprox. 20-25 mins. (or until crispy). Make sure not to crowd them. Give them enough space so they can crisp up nicely! This entry was posted in Breakfast, Side Dishes, Whole30 Recipes and tagged breakfast, grainfree, heallthy, paleo, vegetarian, whole30. Bookmark the permalink. I love recipes like this – simple and delicious! I loooooove crispy sweet potatoes. Like, it’s dangerous to have them around me haha. Can’t wait to try this recipe! There could never be enough crispy potatoes in my book, and I love how simple these are to make! 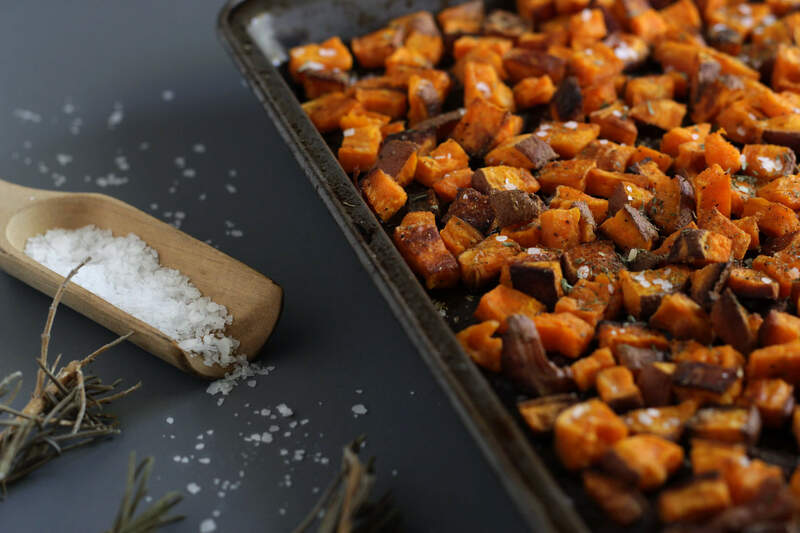 I’ve got a little one coming off the classroom tummy bug that I was planning on sweet potato in the morning for – I think I’ll roast them this way so she can finger food it! Thank you! Love these simple and quick roasted sweet potatoes. They are practical, nutrition, and delicious. Love it !! Yum. Crispy sweet potatoes are soooo good. This is a recipe everyone should have in their arsenal! These look dangerous… as in I might eat the whole sheet pan! So yummy! These look delicious! I miss sweet potatoes so much, but my family still happily enjoys them. Crispy, roasted sweet potatoes are the best! This is one of my favorite side dishes – and they are so easy to make too. Such a comfort food. I have been craving salty snacks and crispy goodness, the timing on this recipe is perfect! The crispiness is the best!! and that sea salt…the only way to go!! I love this, quick, simple, tasty and easy to make dish. Delicious! Two of my favorite keywords here–quick and crispy! Great recipe. Pingback: The Ultimate Paleo Potato Recipes Roundup! - Oh Snap! Let's Eat! I could eat roasted sweet potatoes every single day! Yum!